Metal is one of those things that never ceases bubbling up from the slime and the muck. It's been over 45 years since Master Tony Iommi first played the Devil's Tritone on Black Sabbath. It continues to grow, and in some cases just fester. Metal is the blues of the blues of the blues, if it were all based on anger. It's the scab that won't go away which is part of what makes it pretty damned cool, but Rob Zombie was quite wrong about metal being an unchanging dinosaur. It's never stopped changing. Today we have in our claws, the debut album from Triumvir Foul that's appropriately titled the Triumvir Foul LP. It has a split release date. The CD and digital release happens on 12/11 and the vinyl release is on 2/16. 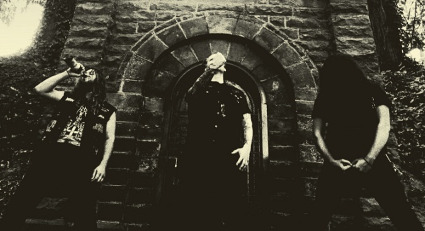 Triumvir Foul is pure metal, but it's not blazing fast like Megadeth. It's not oddly unfocused like Electric Wizard. The guitars are more guttural than standard death metal vocals. They make rusty farm equipment sound smooth. Feedback bookends everything. From the intros, to the solos, to the outros, the feedback is ever present and feels like an old friend...as does the static. The songs on their debut album breath and gasp for air. The music is so thick it suffocates the air in the room. It's ghastly. Frantic solos. Oddly ethereal vocals. Drums that sound like a car in need of a tuneup. These things could add up to a poor and out of touch album, but these are what make Triumvir Foul's first effort such a unique piece of music. Unlike other artistic metal albums, it never sounds like anything other than a collection of songs, but it's more.